In 1901 George Mallory Hendee persuaded Carl Oscar Hedström to develop a prototype for a mass-manufactured motorized bicycle. On February 1st 1901 the tool room of the old Worcester Cycle Manufacturing Company located at 24 Hamlin Street in Middletown, Connecticut, was leased from S. Brooke Page for the sum of $1.00 a day, which included the supply of power, electricity and machinery. It was there that Carl Oscar Hedström began to design, and with his own hands, construct the 1st Indian motocycle [original spelling] prototype. In the early part of May Mr. Hedström took the prototype machine out of the shop and rode it around the block on its initial trial spin. He then towed his friend, S. Brooke Page, who was on a bicycle, up College Hill in Middletown as a test of the power of the motor. Mr. Page weighed nearly 200 pounds and the original Hedström motor pulled him easily. 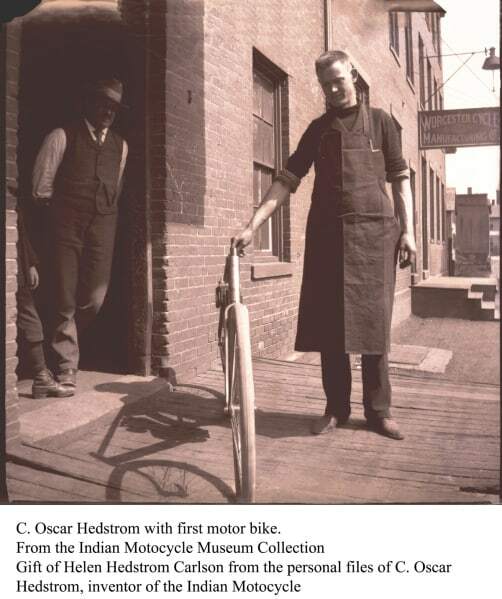 On May 25th 1901 Mr. Hedström had totally completed the prototype, packed the machine into a bicycle case and shipped it to Springfield Massachusetts for the approval of George Hendee, who was engaged in the manufacture of bicycles in Springfield. Shortly upon its arrival, Mr. Hendee took a trial ride with the prototype machine which performed much to his satisfaction. On May 31st 1901 the prototype machine was given a public exhibition on the Cross Street hill in Springfield where, with Mr. Hedström in the saddle, he rode up a 19 per cent grade 350 feet long, making the ascent several times at varying speeds to demonstrate the power and control of the machine. Interest in the prototype machine from the press and potential customers encouraged Mr. Hendee and Mr. Hedström to form a partnership to mass-produce the motorized bicycle with Mr. Hendee as president and general manager and Mr. Hedström as chief engineer and designer. Hedström’s prototype machine was put into production in Springfield, Massachusetts, in 1902, launching what became for a time the largest manufacturer of motorcycles in the world. Story contributed by Chris Hinze.